The 7mm TCU barrel has about 40 rounds through while I was working on a load for it. 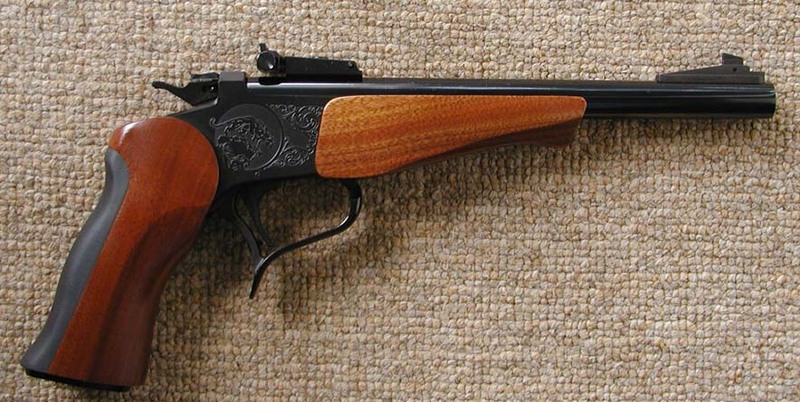 The .22 barrel has approximately 200-300 rounds of Federal match through it. I have the Contender tool/screwdriver, all boxes and paperwork (except for the warranty cards). I'll also include at least 2 boxes of Federal Gold Medal Match ammo with the .22LR barrel. There may be more than that if I find it. Asking $325 for the frame and 1 barrel. $165 for either barrel, but I have to sell the frame first before I sell a barrel separately. Trades considered for a small .380 pistol (Sig 230/232, Walther PPK) or my Contender + cash for a Benelli M1S90. I am looking for a FTF in AZ. Do you know if the frame is shipped separately, is it considered an rifle or pistol? The reason I ask is I have a friend with an ffl, but he is not licesnsed to transfer pistols here in GA. I know the the Contender can be configured as a rifle, hence the question. Thanks. Here in New York, if it is registered as a pistol it is a pistol. Legally, I'm not sure, but the box does say "Contender Pistol" on it and the shop I bought it from sold it to me as a pistol, so at this point I would have to say it's a pistol.